This page concentrates on a few of these topics and more may be added later as information comes to light. The picture on the right shows work sharpening tools in the early 20th century. Lighting was provided throughout by candles. The remains of several can still be found in Wood Mine where they were stuck to the walls by the miners. Others would be stuck onto the miner's felt hat and more would be placed on the front of the tub. Nevertheless, light was at a premium and it is not surprising that a great deal of ore was left in the mines. On a very few occasions when there were special visitors to West Mine, Roman candles and magnesium flares were used to light up the Main Chamber with what must have been a very dramatic effect. Lighting. This candle is one of very few that we find left in the mines. Although candles do not give out much light, it was enough to work by once the miner got used to the dark. It appears from records and evidence in the mines that ventilation was quite easily achieved by ensuring that natural draughts flowed through all the workings; for example, in Wood Mine, the signs of a doorway can clearly be seen in the short-cut passage between the adit entrance and the shaft entrances. However, when a passage was being driven into new territory and a natural draught could not be created, air ducting was installed near the roof of the passage. This was probably fed with air from a fan operated by a boy seated at the entrance to the passage. Research in Wood and West Mines shows that a number of internal shafts and narrow passages were mined purely to encourage circulation of air through the extremities of the mines. Ventilation. Passages driven into new ground as trials or for moving ore needed ventilation until a through route for air could be engineered. distinctive features of such passages are brackets and hand-picked cut-outs for air trunking. The other key requirement in any mine is to have a way to get the ore to the surface easily. 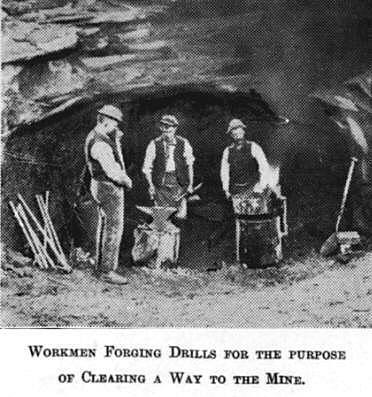 Most British metal mines used shafts although more recently, sloping entrances or drifts have been used extensively. At Alderley Edge, shafts were used by the earlier miners and Bear Pit may represent the main engine shaft for Engine Vein using a Derbyshire model. This could date the shaft to the 1805-10 period and it may have employed a horse engine or whim to wind buckets. In the mid-19th century, the miners developed a system to take out the ore using inclined tunnels so that copper from all the mines was brought to the surface at the crushing plant. Signs of the railways and rope haulage system can still be found underground and a large number of ore chutes have been identified leading to the main haulage way known as the Hough Level. Haulage. The incline from West Mine to the treatment works in the 1920s. This replaced the incline built in the late 1850s which was dismantled in 1858. Unlike in deep mines in for example Derbyshire, water presented few problems. The Hough Level from Engine Vein to the Edge appears to have been driven in the 18th century as a drainage tunnel but there is no evidence of a special drainage route from Wood Mine or West Mine. It appears that the sandstone is porous enough and the Edge is high enough above surrounding country to provide natural drainage. We do believe though that water may have been pumped from the Hough Level at West Mine to feed the works. Also, there is a shaft below adit level at Brynlow and this must have required pumping to keep it dry. Drainage. There is little evidence of major drainage problems at Alderley and most water was probably collected in small quantities in the sumps below shafts and bucketed to the surface.